Even though this is a year old, Im still impressed with the performance. There is something about an Army bugle call that stirs up memories. 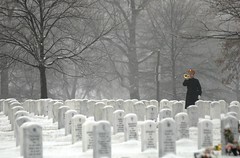 The Army has a website featuring all the bugle calls in daily sequence here. The site also explains the uses for each as well as the sheet music for them. Ive always had a liking for Johnny Cash. The message here is an interesting one too.